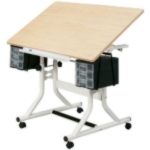 Height adjustable, this attractive work station is great as a computer table or a sign work station. 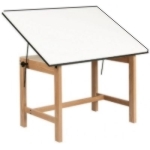 The 24 x 40 tabletop provides plenty of workspace and tilts easily for a comfortable working angle. The top has a tilt-angle mechanism that adjusts the tabletop from 0 to 30 degrees. Attractive, functional and durable, the tiltable table is constructed from the finest quality solid oak. The oak finish is well protected by two coats of clear lacquer while the tabletop has a long-lasting Melamine laminate. Tilt feature enables the user to easily adjust the top angle from horizontal flat to 45 degrees. Top is 60" x 37.5". 30" height. Ships via freight. Rolls everywhere...on shelves, leaning against the wall and especially all over the floor. Heavy rolls of digital media, fragile and expensive. Now you can keep your rolls neatly organized and protected. 4 inch locking castors let you roll around your shop with minimal effort and elegant good looks. Your rolls stay upright because the 2 inch by 17 inch spindles fit the cores like a glove. Small footprint is only 26 inch by 26 inch. 47 pounds of solid steel goes Fedex. Roll up your art, slip it in the bin and it stays safe and organized. Helps to give your shop the pro look. We love these bins, they have been in constant use since the day they arrived. Comes knocked down for easy assembly complete with swivel casters. Holds up 1,000 pounds of vinyl or digital media. 16 roll rack has nine steel ball rollers that glide easily in any direction. 2" or 3" cores, heavy duty chromed steel. Ultra strong steel racks are the finest vinyl storage systems made. Attractive, durable, powder coated finish, easy to assemble. Holds up to 30" rolls with 3" cores. Wall model holds 16 rolls. Kit includes foam holder with 15 blades & 1 knife. Take the classic spinning art supplies organizer and add a 2" round balsa block on top and you have the perfect knife station. Balsa keeps blades from dulling and cleans blades by removing residue. Get tools organized and handy. 72 compartments, revolves silently, improved design, larger size. Holds 4’ by 8’ Sheets. Keeps your shop neat and organized. Five compartments wide enough to store over 30 sheets of 1/8" board in each Bin. Rack is made of 1 inch tubular steel and measures 8’ long, 4’ wide and 59" high.